Used in everything from stir fry to Shepherds Pie it is pretty rare to find a household that does not have garlic in their kitchen cupboard. But, despite it being relatively easy to grow, many gardeners do not include it in their planting. It is a hard working plant that does more than just give a delicious crop though. Like most of the onion family, garlic is great for companion planting. Plant between rows of vegetables especially carrots and its scent will deter pests. This gives a natural boost to your garden's pest protection. Also, garlic is pollinated by bees, butterflies, moths, and other insects too so great for encouraging wildlife onto your plot. There are two main sorts. Softneck (Allium sativum var. sativum) is the garlic which most supermarkets stock. The bulb has a slightly hotter flavour than the Hardnecks, produces more smaller cloves and stores very well. Since the necks are soft, this is the sort you want if you have the time and energy create a garlic plait. They also sprout relatively quickly so are satisfying to grow for the garlic novice. Hardnecks (Allium sativum var. ophioscorodon) are closer to wild garlic, with more complex flavours. These garlics have subtle flavour differences created from the soil and weather patterns in the region where you grow them. The advantage of Hardneck varieties for the cook is that their skins usually slip off easily. They do not store as long as Softnecks though. Cure and eat them within 3 to 10 months, depending on the variety. There is some debate about hardiness with some believing that Softneck will grow only in the warmer parts of the UK so if in doubt in the coolest parts of the UK it might be a better to choose Hardneck. Which you choose is up to you though as there is anecdotal evidence of both thriving in areas of the country where they should be struggling. There are many varieties of each sort to choose from depending on the flavour and bulb size you would like to produce. Garlic needs a long growing season. The cloves can be planted in late Autumn or early Spring but you will get a bigger crop if you plant in Autumn. Whatever variety you choose, to grow well, it needs a cold period of at least two months. For Autumn sowing, it is therefore essential to sow from early-October to allow the roots to develop before the cold weather sets in. With this in mind Hardnecks should be planted at the beginning of October but Softnecks can wait until around Christmas time. The Hardnecks will be slower to show themselves so even with this planting timetable you may see the Softnecks appear first. We recommend growing garlic in a rotation system with carrots, onions, leeks, and other root vegetables. A classic rotation is tomato family, broccoli family, onion family including your garlic. But as a companion plant we find it makes a great space filler between carrots, sweet peppers, spinach, lettuce and parsnips, roses and other flowers too. It can be planted directly into the soil but if you suffer from pests such as birds ripping out your young plants then sowing into Rootrainers first may help your plants survive. See our recent Overwintering Onions Blog for the full story. Plant in fertile, well-drained soil. A Raised Bed works very well. Remove stones from the top 6 inches of soil. Work several inches of compost or well-rotted manure into the bed, along with your fertiliser of choice. Break up the bulbs no longer than 24 hours before you plant them. Be careful not to bruise or damage them. Sow the individual cloves 10 cm below the surface, root down (pointy end up) around 4 inches apart to give the bulb room to grow. Hardneck garlic loves to flower. Cut off the stem close to the base of the bulb once the flower stem starts to coil. This will concentrate the plants' energy into the crop beneath increasing the size of the bulb. Try to harvest when the weather is dry. Loosen beneath it with a fork to prevent bruising the bulb then pull up like a weed. Leave the plants on the surface of the soil to dry in the sun for a few hours. Move to somewhere warm and dry, to cure for 3 weeks. Thoroughly dry the bulbs then store them in a cool, ventilated place away from sun. Garlic is unbelievably good for you. It can lower blood pressure, fat and cholesterol levels. It can also combat bacterial, fungal and viral infections. There are lots of opportunities for the gardener growing their own garlic to plant a few extra and leave it to flower or to experiment with young garlic, picked before it has matured. As well as eating the bulb the leaves and flowers are also edible. They have a milder flavor than the bulbs, and are most often consumed while immature and still tender. You may see "green garlic" in the shops. This is immature plant that has been pulled rather like a scallion. When green garlic has grown past the "scallion" stage, but not fully matured, it may produce a garlic "round", a bulb not separated into cloves like a mature bulb. This imparts a garlic flavor and aroma in food, minus the spiciness of the mature bulb. This entry was posted in Grow At Home and tagged Raised Bed Base, Patio Raised Beds, onions, raised bed, GYO, growyourown, growyourownfood, organic, garlic, Rootrianers, garlic bulbs, shallots, soft neck, hard neck, Allium, green garlic, scallions, garlic flowers, pollinators, companion, companion planting, Wight, CHESNOK WIGHT, PURPLE WIGHT, GERMIDOUR, SOLENT WIGHT on 14th January, 2019 by Haxnicks. Rootrainers are what I've chosen for years to grow overwintering onion sets, garlic and spring planted onion sets. Onion sets (small immature onions) allow me to have onions all year round. But, originally manufactured to grow tree seedlings, why would I use Rootrainers for onion sets? Growing onions from seeds can be a hit and miss affair, with weather, birds and the like all affecting the young seedlings’ growth outdoors, particularly those seedlings that have to overwinter. I am not after prize winning onions anyway or even huge onions so don't need to use onion seeds. I prefer sets. However, whenever I planted sets direct into the soil outdoors, within a few days, I would find many of the sets had been pulled up from where I had planted them and scattered all over the soil. Who or what was responsible? The root zone is the name for the region of the soil around plant roots as they grow. The roots produce secretions that help and protect them as they force their way downwards through the soil. The immediate area around the root is called the rhizosphere. There will be many rhizospheres within the root zone of a plant. The rhizosphere is the most dynamic environment in the soil, or a microbe ‘hot spot’, the fast food areas of the soil! The roots are also continually shedding old tissue and sloughed-off plant cells. The root secretions and dead plant cells are a feast for microbes living in the soil. In return the soil microbes provide nutrients for the plants, which encourage plant growth. More plant growth means more roots. A win-win situation! Hence soil microbes themselves congregate around the roots. Microbes in turn are a beacon for earthworms, who sense the root secretions and microbes in the soil and target such ‘hot spots’ to feast upon them! In my garden its the blackbird. Blackbirds deliberately pull up the onion sets to seek out earthworms and other such tasty morsels, living and feeding in the root zone underneath the onion set. 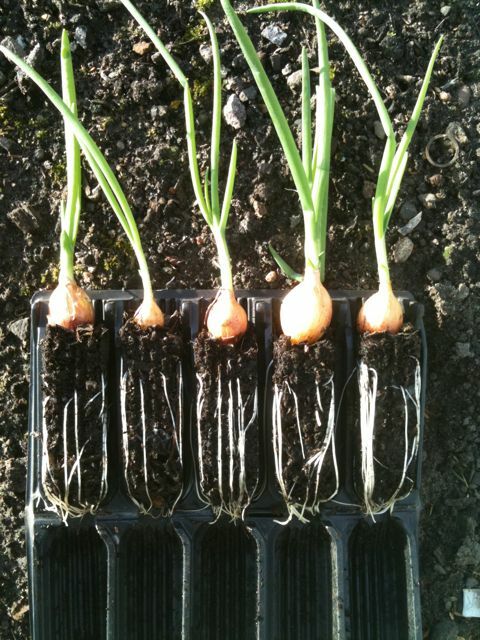 By planting onion sets in Rootrainers, the roots will grow in and around the compost, binding it together. Then when planting them outdoors, unless the blackbird has fed on at least 3 Weetabix (!) that morning, it will not have the energy or strength to pull out the onion set with its well rooted fibrous compost ball, which is a lot heavier than an onion set on its own. Result: no more scattered onion sets! Due to their size onion sets are great for children and school projects too. Handling them is easy. Planting requires less skill as sets are easier to handle than seeds. Together, sets and rootrainers make the exercise easy and interesting for children to do for themselves. One major advantage for schools is that the children can grow AND harvest them all within the school year. This entry was posted in Grandpa Haxnicks and tagged Deep Rootrainers, Rootrainers, Air-Pruning, onions, gardening, allotment, GYO, growyourown, growyourownfood, allotmentlove, allotmentlife, onion, onion sets, overwinter, overwintering onions, overwintering, rhizospere, root zone, garlic, spring onions, School gardening on 29th November, 2018 by Haxnicks. This is a vegetable cake, it can be nutty by adding the walnuts, or extra yummy by adding the optional cream cheese icing, which is completely delicious. If you have too many courgettes you can even add these instead of carrots. Pre-heat the oven to 170°C /325°F/ gas mark 3. In another large mixing bowl beat the eggs, add all the sugar and then slowly, little by little add the oil beating all the time. This may look a little odd but worry not as it will look better after you have added the rest of the ingredients. Add the dry ingredients, carrots and the nuts – if you are having nuts. Mix it all up. Pour the mixture into your tin and put it in the oven for 45 – 50 minutes, until it is golden brown and has passed the* cake cooked test. Take it out of the oven, allow it to cool for 20 minutes, before turning it out onto a wire rack. When it has cooled properly spread your icing on the top. Cream together the butter, cream cheese and vanilla, when this is soft add in the icing sugar. It should have the consistency of very soft smooth butter. Downloadable pdf for you to print here Carrot or Courgette Cake. This entry was posted in Madeleine, Recipes and tagged Vegetable Patio Planters, gardening, courgette, allotment, GYO, carrot, growyourown, cake, recipe, carrot cake, eat, plottoplate, eatwhatyougrow, growyourownfood, treat, cupcake, sponge, allotmentlove, allotmentlife on 13th July, 2018 by sarah talbot.